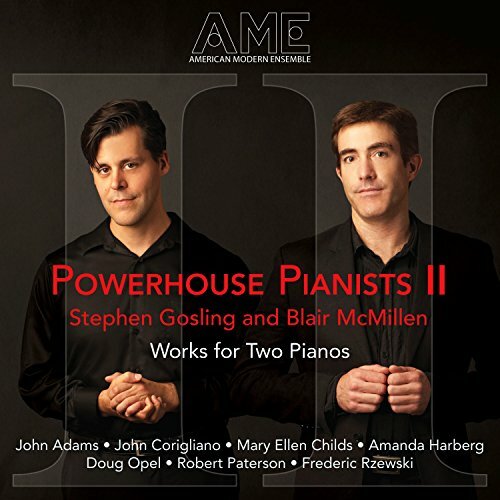 Powerhouse Pianists II is the thrilling follow-up album for the American Modern Ensemble's original Powerhouse Pianists album which also featured Blair McMillen and Stephen Gosling, performing an electric collection of solo works for piano by American composers. Perhaps the most striking aspect of this recording is how the simple addition of a second piano explodes the textural and coloristic possibilities. Deep Blue Ocean, a poetic and powerful three-movement rumination on the sea by American Modern Ensemble founder Robert Paterson, opens the album with intense waves of resonance holding up tinkling rising patterns that burst into block chords, punctuating the pastoral subaquatic scenes. Doug Opel indulges the playful possibilities of the dueling pianos in Dilukkenjon, with the two pianos engaged in a tension-filled championship race to the finish. In Subway, a swinging take on mass transit, composer Amanda Harberg takes full advantage of the 176 keys available to her to capture the swirl of activities and personalities that flow underneath New York City. The frenetic pulse melts into the simple patterns of Mary Ellen Childs’ Kilter, which evoke a sense of mystery and mysticism as they become inextricably entwined. In John Corigliano’s show-stopping Chiaroscuro for two pianos tuned a quartertone apart, traditional harmony and musical gestures swim in a sea of microtonal surrealism to great expressive effect that goes out with a bang. John Adams evokes the vast expanses of the American west with his ecstatic brand of minimalism in Hallelujah Junction and the disc closes with a two-piano arrangement of Frederic Rzewski’s raging industrial masterpiece Winnsboro Cotton Mill Blues from Four North American Ballads. It’s taken five years to release [Powerhouse Pianists II], but the wait was worth it… The performance is consistently fluent, meticulous, inspired and well recorded. Robert Paterson’s triptych Deep Blue Ocean starts with Jazzy evocations, slips into Messiaen’s stained-glass harmony, goes salsa, then concludes with expansive pop ‘power’ chords that gently pulsate: a fun, uninhibited piece. Doug Opel’s Dilukkenjon is a stylistic pudding packed with dissonant repetition, post-minimal noodling and lyrical episodes… By contrast, Amanda Harberg’s Subway splices and dices rock/blues clichés into fresh, unpredictable pattens. Mary Ellen Child’s Kilter is a carefully crafted large-scale work characterised by repeated notes and a kind of Asian modality. Gosling and McMillen take the opening section slower and more suggestively than in Anthony de Mare and Kathleen Supove’s slightly faster, more incisive 1995 recording (XI Records).